The weekend before last, I hosted a little Family Reunion. 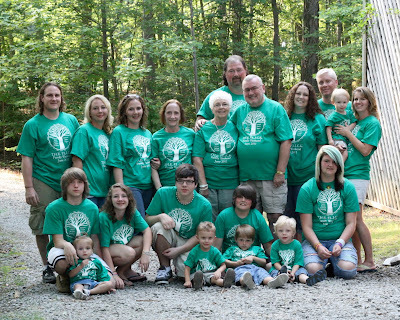 Including my family of four, there were a total of 20 family members - 10 adults and 10 kids - ages ranging from 2 to 16. My parents flew in from New Mexico, but everyone else drove here from Indiana (that's where I grew up). Because of the great neighborhood we live in, and the awesome friends we have, we were able to "borrow" two homes for all of my family to stay in. Since I needed to be able to direct everyone to what beds they would be sleeping in, I created a little something for each of them when they arrived. Located on each family member's bed was a t-shirt (more on that in a minute) and a little goody snack bag. These two were for my cousin and her husband. No, my last name is not Flick. T.H.E. F.L.I.C.K. is actually an acronym using the first letter of all of our last names, including my Grandparents, Gene and Maxine Edwards. They've long since passed, but without them, none of us would be here. That's them in the picture on the goody bag label. Every label had the letter "E" in a light green, and then based on whatever your last name happened to be, then that letter was in a darker green - my cousin's family's last name is Koons. Now for the t-shirts. Before Memorial Day, I started thinking about designing a t-shirt for our little reunion. I scoured the internet looking for the least expensive way to possibly do this for 20 people. Then I went to CustomInk.com to check out their prices. I have used this website three times before, and have always been very pleased with their product. Their prices were pretty reasonable (about $9.50/shirt)- reasonable enough that I felt comfortable asking everyone if they would be interested in purchasing the shirts for their each individual family. BUT THEN, my amazing father, offered to BUY the shirts for EVERYONE. WOW!! Thank You Again, Dad!!! Here's all of my family, sporting the custom designed t-shirts from Custom Ink. So wish they were all still here. We had an absolute blast!! How fun, what a big job to organize a reunion! I am a big fan of matching shirts, well done!